Star is the site coordinator for the Thanksgiving Blessing at the Mountain View Community Center: She arrived around 7:30 a.m. Monday and will stay until around 10 p.m. She’s preparing to distribute full Thanksgiving dinners to more than 3,000 families over the course of the day, and she expects to be joined by about 400 other volunteers. 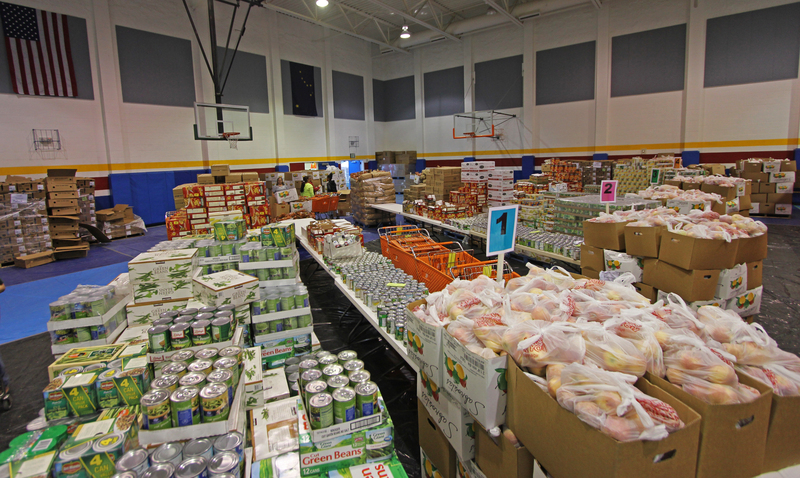 Monday morning, before the doors opened to the public, the west side of the community center gym was filled with dozens of pallets of canned vegetables and fresh fruit and frozen turkeys. The Thanksgiving Blessing event is organized by the Food Bank of Alaska and made possible by hundreds of donors and volunteers. The Mountain View Community Center is one of six sites in Anchorage. It’s also the largest. As dozens of people formed a line outside Monday morning, Star directed a swarm of volunteers inside the gym and scrambled to catch up. Things were running a little behind schedule. A truck expected to arrive Sunday night didn’t show up until Monday morning. The volunteer orientation was supposed to start at 11:30 a.m. Things still weren’t completely set up. “There are so many things that don’t go the way you plan, that you just have to take it by faith that it’s all going to work in the end,” Star said. Sitting in the community center lobby, Mountain View resident Jason Greer was the first person in line to pick up food at the community center. The doors were set to open at noon — Greer was waiting at 10 a.m. He sat and chatted with volunteers and the few other people waiting next to him, and said Thanksgiving is one of his favorite holidays. He said he planned on sharing Thanksgiving dinner with his sister this year. It would be good to catch up. Dave Barney, manager at the Mountain View Boys & Girls Club, stood in the doorway to his office and said the annual Thanksgiving Blessing isn’t limited to just Monday. Sunday was spent preparing for the massive flood of people, and Tuesday would be spent cleaning up. Still, he said, the chaos is worth it. It fits the building perfectly. By the time the food distribution ended Monday evening, Star said it had served more than 2,700 families. More than 8,000 people collected food from the Mountain View Community Center. Star said she loved seeing the happiness on their faces as they prepared to celebrate Thanksgiving dinner, and she loved seeing the generosity of the volunteers who gave hours of their time. There were volunteers in their 80s who’ve come back year after year, Star said, and volunteers in elementary school who helped load shopping cards and serve cookies and coffee to people waiting in line. More than 2,700 families collected Thanksgiving dinner from the Mountain View Community Center, where piles of food sit waiting Monday morning.